How Can I Get My Brochure Done Fast? If you are running out of time and budget but need to get a professional brochure done immediately for your should-be-yesterday-deadline trade show or presentation, you can get help fast from ready-made brochure templates. There is a wide range of brochure template to choose from and available for download at 24×7 so you can meet your deadline immediately with compelling and enticing brochure. Why use Professional Brochure Templates? 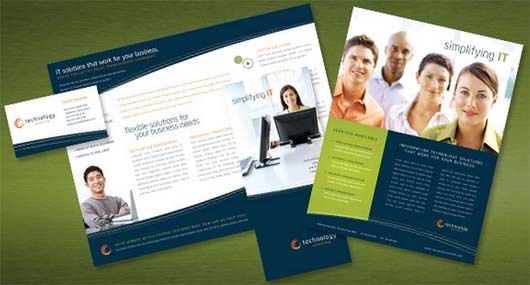 Today, ready-made brochure templates are no longer restricted to clip-art or amateurish look. They are well-designed and available in different file formats so you do not need to spend a fortune on the graphic software or engage a designer to edit it. You can always download the format you want for example, in Microsoft Word format and edit it to your liking. Once done, you can immediately send to your in-house printer for printing. Besides time saving, professional brochure templates are much affordable than designing from scratch. The main reason is the brochure templates are all pre-designed with layout, artwork and high-resolution images. This helps you save on purchasing stock images and their related license. You are free to use as many times and on any media as you like. In short, you will not be caught with copyright and licensing issues when you use a professional brochure template. However, if you find the images from the pre-design brochure template do not reflect your company brand image. You are free to change or customize it with your own or you can purchase directly from established stock images such as iStockphoto.com. Purchasing from a legal stock image company will free you from copyright and licensing problem. Most of you must have experienced that, at times, if you want to make slight changes to the brochure, you either need to go back to the graphic designer or struggle to get the right graphic software to edit it. You will be glad to know that with the current brochure templates available in many different formats, you can pick the format that you want and edit with your own software without incurring extra expenses. This will free you the need to rely on graphic designer for any changes of text. You can kill two birds with one stone when using brochure template. You do not limit just by printing out as physical copy but you can convert it to soft copy and email to your customers directly, saving you tremendous amount of times and efforts. How to Get a Copy of Brochure Template? Click here to select a category and pick a design that you like. Add it to the Shopping Cart and make payment. Download the file and customize it. Your brochure is now ready for viewing. However, if you think brochure template do not reflect your branding or needs well, you are welcome to contact us.